Including a poster, printable activities, and more. Looking for ways to give back to your community during the holiday season? Organizing a food drive is a simple, impactful way to make a difference—and #GrinchforGood is here to make it easy and fun for your students, with a free kit featuring everything you need to get started. 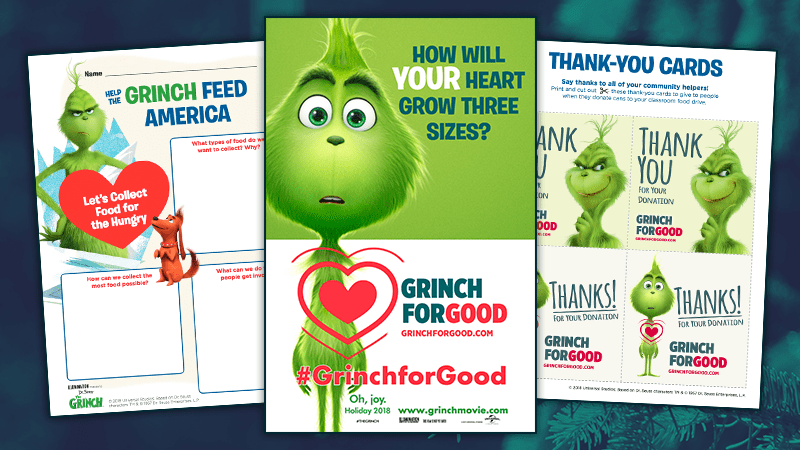 You’ll be joining hundreds of other teachers around the country in organizing a #GrinchforGood campaign, challenging YOUR students to grow their hearts by three sizes. Just click the button below to get your free kit, including a classroom poster, activities, family letter, and more. The best part about the #GrinchforGood movement? It all ties back to the curriculum, with activities connected to English/language arts, math, and social-emotional learning. Sounds awesome, right? We can’t wait to see your #GrinchforGood photos on Facebook, Instagram, and Twitter. Thanks for helping to make your communities a better place. Just click here to save and print your free kit.